Thanks for including me here, @eddieb! Actually, I’ve invested in BTC already. But I’m holding it for now. I plan to buy more BTC and use that to trade. I’m still choosing between ETH and XRP at the moment. ('Cause I plan to focus my investment on 1 alt for now) What do you think? Yeah. That makes sense. I mean, right now, it’s practically a gamble. Thanks for sharing that, @eddieb! I guess it’s best to wait for new happenings and wait as to where the odds will turn. Bitcoin was unable to build on its small gains from yesterday and at $9380, it is now closer to $9000 than the $10000 mark. Sentiment towards cryptocurrencies is turning sour with negative headlines pouring out from left, right and centre. Concerns that Facebook is banning ads and major crypto exchanges shutting down has really silenced the hype and some people are probably having second thoughts about investing their hard earned cash into digital currencies. With prices falling, would-be buyers are probably waiting on the side-lines until the downtrend is over, while existing buyers may be withdrawing to avoid giving back any remaining profit they may have accumulated. But all that could change very quickly once there’s clear evidence prices have bottomed out, as I am sure there are still a lot of people wanting to get on board when the time is right. For now though Bitcoin and other cryptos remain out of favour. It would be interesting to see if the rising government bond yields would weigh on noninterest-bearing assets like gold and Bitcoin. These buck-denominated assets could come under further pressure in the event the US dollar makes a comeback on the back of Friday’s jobs report. 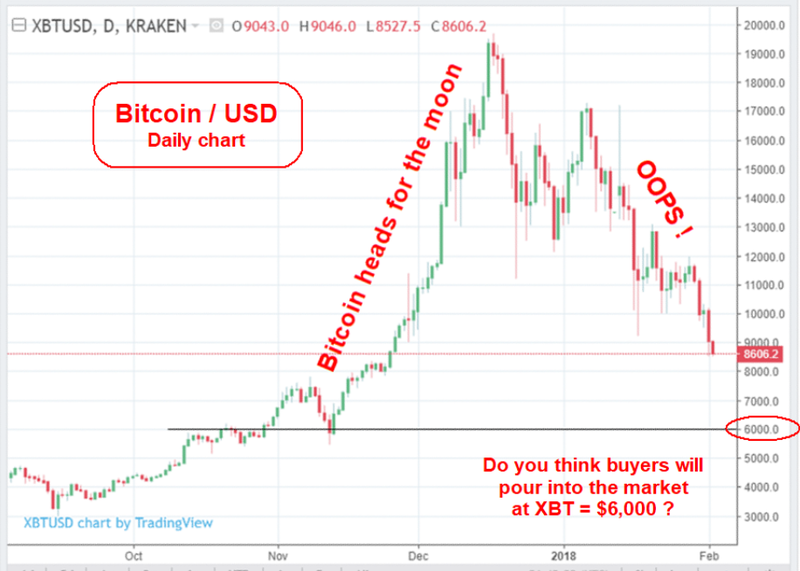 So, things are not looking great for Bitcoin right now, but that could all change suddenly due to the possibility of pent up demand. But the manner in which Bitcoin prices have been going down suggests they are in distribution phase, which is probably not something that crypto bulls would want to hear. There is thus the danger we could see a sharper decline in the coming days before Bitcoin potentially bounces back. That being said we are continuing to monitor price action closely and watch for signs of a reversal. Specifically, we are keeping a close eye on recent highs, as when a prior high is breached, this could signal the end of a downtrend. As things stand, Bitcoin’s most recent high comes in at $11990 and this is now the bull/bear line. On the downside, some of the potential bearish objectives are as follows: 9220 – the most recent low; 8180-8310 range – this is where an old resistance level meets the 127.2% Fibonacci extension level of the most recent price swing; 7775/80 – the 200-day moving average and finally 6550-6855 range – old resistance and 161.8% Fibonacci extension level of the most recent price swing converge here. It’s the 800-pound crypto gorilla in the room: crypto scams exist. That’s the main reason Facebook just banned all crypto ads, including ones that promote bitcoin and ICOs. Truth be told, if you have to advertise your new crypto investment offering on social media, it’s probably not worth buying anyways. But I digress. South Korea also cracked down on crypto scams recently, and the country has uncovered $600 million in crypto-related crime. Some crypto skeptics were worried South Korea would shut down trading on exchanges, but it only introduced new regulations. And in December, the U.S. Commodity Futures Trading Commission sent subpoenas to crypto exchanges Bitfinex and Tether, the latter being a controversial project that claims to peg a cryptocurrency to the U.S. dollar. Notably, the two projects share the same chief executive officer. BitConnect also raised concerns. A second lawsuit was just filed against the cryptocurrency exchange after it shut down. The suits claim it’s a Ponzi scheme. Now a temporary restraining order on its assets has been granted to help plaintiffs recover their funds. After this onslaught of news, bitcoin prices understandably retreated 12% on Thursday, falling below $9,000 for the first time since November. But, as it always happens, it will bounce back. For those who buy during these dips, who have a plan and don’t let the scams shake your outlook of the crypto market … you’re well-positioned to profit while others miss out. So What Exactly Is a Crypto Scam? It’s easy to say: “Be wary of scams.” But what exactly do you look for? Well, I can give you an example of one crypto asset that’s raising some red flags. As I mentioned before, Tether is a “stablecoin” — a cryptocurrency intended to represent the U.S. dollar. It allows crypto traders to move in and out of virtual currency without having to cash out of the exchange and into a bank account. For instance, an investor who owns bitcoin on the Bitfinex exchange and wants to get out can trade it for tethers. Sounds great, right? Many people agree. Currently, there are 2.2 billion tethers in circulation. Each tether represents $1, so there should be a reserve of $2.2 billion in a bank somewhere should holders wish to redeem their tethers for dollars. For the past few months, there have been growing concerns that the group behind Tether has been printing the virtual currency without keeping an equivalent reserve in a bank account. According to Tether’s website, the last audit was on September 15, and it showed a reserve of $443 million versus 420 million tether tokens. However, we know the amount of tethers on crypto exchanges has ballooned to 2.2 billion since then. There’s a lot to be accounted for here. If tether isn’t pegged to a matching number of dollars, the company would be able to print ceaseless amounts of tokens, making them become essentially worthless. We’ll continue to hear more about tether as the Commodity Futures Trading Commission investigates it. But this is one crypto asset to be wary of. Ultimately, it comes down to doing your research and relying on trusted sources, exchanges and experts. For example, Coinbase, Kraken, Bittrex and Cryptopia are somewhat trusted exchanges. Be cautious when considering involving yourself with an ICO. These are where the “pump and dump” schemes can happen. Of course, there are promising ICOs out there, but to find them, you have to keep your ear to the ground. I’ll continue to keep you updated on them here. Wot ? You mean like the Fed and BoE etc etc routinely do ? It is the first time that such a robbery has happened. Interesting situation there - Wealthy “Investor” Gets robbed - so presumably he makes an insurance claim ? But he gets attacked in broad daylight by four blokes who seem to have been easily distinguishable as being out of place in a setting guaranteed to have plenty of observers. Wealthy Individual transfers the stolen thing from his computer to another computer. So how much will the INsurance company pay out ? Current value - or what he paid for the thing ? Then of course there is the other question - does my ordinary household insurance cover theft of bitcoin transferred away from my computer - by me ? Dunno mate, interesting TIMING too “gets them stolen” - just as bottom appears to drop out of market ! when only witness is “Girlfriend” - but the four hooded “athletes dressed in black” - have been seen by very many witnesses. This is getting ugly, but that is when you need the courage to stay in the game and keep buying. BBC World News just reported that Goldman Sachs suggest Bitcoin and many other cryptpcurrencies could fall to zero very soon. I’m not entirely sure that giving too much credence to competing “Money providers” is a wonderful idea. Looking at the daily chart, yesterday was slightly up - but there was a BIG volume spike. The difference of opinion of people supposedly in the know is definitely confusing. Another big investment bank gives in on cryptocurrency, says Bitcoin will be "akin to gold." Earlier, I wrote a fundamental piece about the recent moves in the FX, bond and equity markets, and mentioned that something doesn’t quite add up. Well, lucky for me, I am first and foremost a technical trader/analyst rather than a fundamental one. It doesn’t really matter what I or you think ‘should’ happen. As long as price says to me it wants to go up then I am bullish, and if it is telling me that it wants to go down, I am bearish. Of course I and you can have longer-term views on the direction of prices, but this shouldn’t cloud our judgement when it comes down to short-term trading. But sometimes when things don’t line up, it may be best to stay on the side-lines. If you have to trade, then take things from one level to the next and move on, or look for possible opportunities in the FX crosses and something very different like Bitcoin. Speaking of Bitcoin, the cryptocurrency has managed to bounce back in the past few days after declining sharply. In some exchanges, it rose to the $10K hurdle before easing back a little on profit-taking. Recent price action has been somewhat bullish. As the one hour chart of CMA Bitcoin futures show, it has been putting in a series of higher highs and higher lows on the lower time frames. On the daily, it has shown willingness to hold above the 200-day average. We have seen some volume coming into Bitcoin as it traded around the 200-day average. The 1-hour volume weighted average price (VWAP) is now trending higher. Bitcoin has broken above a key short-term resistance zone in the $9000-$9250 range. This area has since turned into a bit of support. For as long as price holds above this area then the short-term bias would remain bullish. However, if it goes back below this $9000-$9250 range then one would have to strongly consider the bearish scenario given the recent declines on the higher time frames. The next area of resistance is between $9800 and $10100. This area was previously support. Further resistance comes in at $10850, followed by $11750.